"What are YOU paying attention to??? While you were distracted by the shooting at LAX, Obama signed America in #Agenda21 hell!!!" President Obama issued an executive order (EO) entitled “Preparing the United States for the Impacts of Climate Change” this week to once again circumvent Congress. 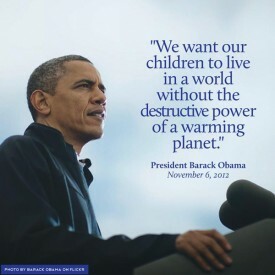 Obama threatened back in February that he would issue an EO on climate change for the sake of future American generations if Congress will not act. Pressures of climate change are being felt by “species and habitats” that are in need of being protected. Obama’s EO establishes a Task Force on Climate Preparedness and Resilience (TFCPR) to find federal funding to be spent on interior US infrastructure with regard to combating climate change. According to the Fact Sheet on the EO on climate change “preparedness” the TFCPR will advise the Obama administration on how to deal with changes to our environment.